Don't be stranded with a disabled vehicle without an emergency road and safety kit. 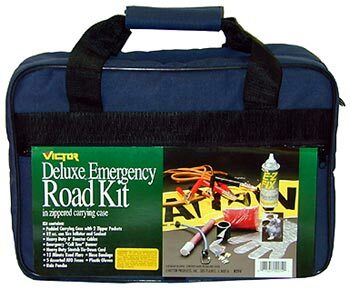 This deluxe kit provides you with the peace of mind that you will be prepared to help yourself and others in unexpected roadside emergencies. It contains all the essentials for fixing the most common highway problems and comes in a convenient carrying case. By Victor.